For the most part, Americans have become so obsessed with 20+ PPG that we forget the impact a player does all of the little things can have on a team. Obviously, Europe recognizes this and that’s one of the reasons, that the world has caught up with the U.S. The whole mentality and development of basketball in this nation in the U.S. needs to change, and I believe it starts at the bottom with youth basketball. We need to do away with (or at least change) all of the Addidas, Nike, AAU youth camps that forces coaches and players to focus on winning, instead of the EMOTIONAL and PHYSICAL development of children. We have do not have any (or very little) logical progression and continuity with the development of youth players. We have rankings for 10 year olds! Heck, I don’t know if I even knew how to tie my shoes when I was 10. Now, we have kids being compared against other kids nationally? Come on. Not to mention, I guarantee most of the kids are burnt out by the time they reach high school. Year-long basketball, pressure for 10 year olds to college scholarships, and shoe companies talking to middle school players? Let kids be kids and let’s focus on their overall development. Other parts of the world have picked up on this. Shouldn’t we? Here is another email conversation with Don Kelbick & an aspiring women’s college coach. These tips are extremely useful to anybody trying to become a college basketball coach. I am in the military. When I get out I want to coach women college basketball. I wonder what I need to do to get prepared, what degree does coaching fall under and any advice that I need to know to get started with coaching? Your email was forwarded to me by Breakthroughbasketball.com. I write many article for them and I have coached on the college and professional level for over 25 years. I hope I can help you. In regard to degree requirements, it depends on what level you want to coach. At the Div. I level, just having a degree is enough. As you move down in level, the subject matter becomes more important. As you move down (Div. II, Div.III, NAIA), many schools look for a Master’s degree as well. If this seems backward to you it is because of this reason, at Div. I level, they hire coaches. They have the resources to support an autonomous department. At lower levels, the athletic department is often integrated with other departments. For that reason, many (but not all) coaches on those levels have to teach as well. Also at those levels, it is very rare, if ever, that that there are full-time assistant positions that do not include teaching. Many departments are integrated with a Phys. Ed/Recreation/Education Depts. Some are through Student Services. There are no hard and fast rules and each school is different. A lot of it depends on where their funding comes from. I would recommend that at least one of your degrees be in Education. Whether it is Phys. Ed. or somewhere else is up to you but most teaching areas tend to lean that way. At sub-Div I levels, it is not uncommon for positions to be part time or coach multiple sports. Especially at the Div. III level you see a Head Coach and an Assistant in another. You will also see things like Sports Information or Facilities Manager or Intramural Director as an added responsibility. Again, this is based in finances. Many positions are part time, volunteer or Graduate Assistant (a great option if you want to get a Master’s Degree). It is most important to know that coaching is very much a contact based, not knowledge based, profession. Even at the highest levels this is true. I had a friend who is an NBA coach say to me “Nowhere on an NBA job description is the word competence.” It is who you know, not what you know that gets you jobs. Of course there are things you can do where you can gain contacts and knowledge. The best place is to work at summer basketball camps. Camps sponsored by Universities or “exposure groups” such as Eastern Invitational or 5-Star are the best way to go. They get the most knowledgeable and best connected coaches. Go to national clinics, such as Nike Clinics, and use them as educational and networking opportunities. You can volunteer as a coach or administrator at a basketball program near you. The biggest “surprise” for coaches new to college coaching are the administrative and ever-present recruiting responsibilities. The higher level you go, the less the job is about basketball. Academic and eligibility responsibilities are present every day. Lastly, understand that it will take time and might be extremely frustrating as you try to establish yourself. There are a finite number schools and only a small percentage of jobs open each year. It is kind of like the Mafia, someone in front of you has to die for you to move up. You can use www.NCAA.org as a resource for job openings. You also have to understand that the political climate for males coaching in women’s sports is not really positive right now. There is a need for female role models to be in front of women and I am not sure that I disagree with that. That is not to say that it doesn’t happen, but it can be an obstacle. I hope this gives you some insight. Don’t get discouraged, just keep pluggin. I have one good shooter and two good post players. I need an offense for my team. Anything would help out would be great. If only the answers were easy, we would all be undefeated. I would need more information to give you an answer but I can give you some concepts. Then you trust yourself and your instincts, keep it simple, use a little trial and error and I am sure you can come up with an offense of your own. First, you say you have 2 post players. Most teams don’t have any so you are blessed. However, if they both posses the same skill set or have to occupy the same area, they will get in each other’s way and cancel each other out. That is why the “Twin Tower” experiments (Houston’s Sampson & Olajuon, NY’s Ewing & Cartright) didn’t work out too well. Next, you say you have a good shooter. The effect of shooters with good post players is profound. If you use him wisely, he will open up many and varied options. Good shooters strip post help. If the shooter and the post player are on the same side, the shooter’s man cannot drop down to help in the post. If the shooter is on the other side, your players will be able to penetrate due to the fact that the shooter’s man cannot help. If his man does help, it will open penetrate and kick opportunities. Lastly, an old concept but a very effective one. This is what most offenses are based on. The offense, with 5 players, is divided into a 3 man game on one side, and a 2 man game on the other side. Screen-downs with shooters and posts are very effective. Ball screens with kick opportunities are also very effective. You need to have someone to handle the ball though. Keep your shooter moving, as much as possible. Use your post players to screen for him so the post defender has to make adjustments and that will open the post. As I said, try and to keep it simple and experiment. Most of all, let the players do what they are good at in areas in which they can be successful. I don’t know if this helps but hopefully it will at least be a start. Let me know if I can help you any further. In our Man to Man Defense System, we discuss situations and options when playing with the lead at the end of the game. One of the options we discuss is to overplay the outside shot and force the players to dribble penetrate when you are winning by 3 points with minimal time remaining. When doing this, it is important to have no help defense from teammates! All of the defensive players stay around the 3-point arc in the area of the offensive player they are guarding. Even if the player gets an uncontested lay up, you are still winning the game. When forcing the player to dribble penetrate, force them to the direction of their non-shooting hand. If they shoot with their right hand, force them to dribble to the left. Now, let me tell you why. If an offensive player is covered and can not attempt a 3-point shot, the player will often take one hard dribble and pull up for the 3-point jump shot or dribble inside the arc and use a step-back move to create separation to get the 3-point shot off. 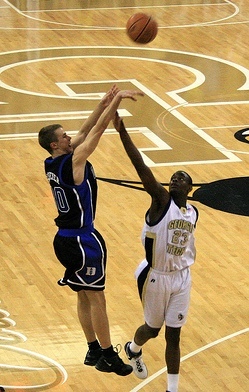 If you have forced the player to his weak hand, you are on the shooting side of the offensive player. Now, you are in great position to take away or disrupt the offensive player’s shot. - A deflected or blocked shot. - An offensive player panics and turns the ball over.If you are not on the shooting side, you have to reach across the player’s body to disrupt the player’s shot which can often lead to a foul. As a coach, if you do not feel comfortable with your players’ decision-making, have them put their arms straight up instead of trying to block the shot. There are times that players will make miraculous shots, but this approach will help you win more games in the long run! A great way to get your players to perform in the clutch is to use this End of Game Drill. This drill is great for all levels, because it is also a fun way to end practice. If you are a youth coach, I would NOT bother covering this situation in depth. There are more important things to cover!